I'm probably not going to read this book, but it caught my attention as I was perusing e-mails from book blogs I'm subscribed to and the entire picture just sort of caught my attention. I guess I could be the one of few people on earth who doesn't care for the color red, but it definitely DOES stand out, and I find myself more often than not readily drawn towards pictures (and in this case, book covers) that happen to have a woman wearing a red dress. It's not even a bold red, but a typical, well-worn, solid red dress. And it's eye-catching. Add onto that the wistful feel of looking over a house on a lake with a mountain view in the background, and somehow, the entire feel of this cover jacket is kind of nice. I could do without the type-face of the author and title. In fact, the font and the entire effect of the author/title combination is just kind of distracting. I'm not sure how it could be changed for the better. Maybe set in smaller font size in a corner somewhere? 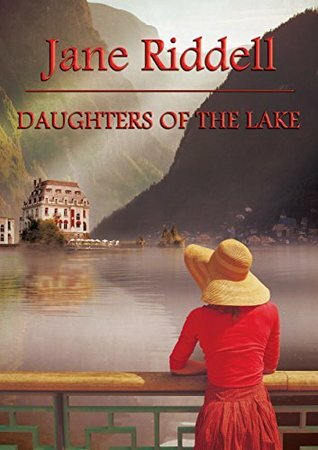 Anyway, Daughters of the Lake looks to be a human drama type of fiction; something I don't often pick up, so the chances of my reading it are pretty nil.